Hello and welcome! The Papertrey Ink Countdown has officially begun, yay! I bet you've been waiting anxiously for this moment. Well, today is also the Design Team Group Post day and Nichole has given us a super fun assignment: to create a project using the new Button Boutique stamp set and the rest of the new button product line-up (which is available Feb. 15th). Be sure to stop by Nichole's blog for all the details, your not gonna want to miss this one! Trust me. So, today's post is all about buttons! 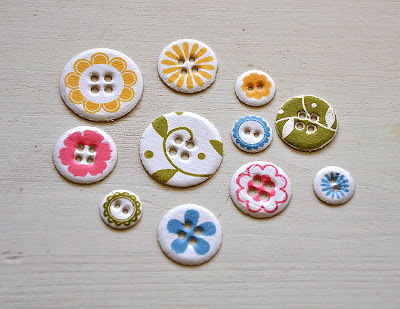 And if you've been around me for a while, you will know that I am crazy for buttons. This is my kind of post! This group was stamped using the images included in the new Button Boutique. Next, I took it a step further and pulled out a bunch of previous set I thought would look great covering a button. This is my favorite, the flower/leaf collection. Sets used: Beautiful Blooms II, Beyond Basic Borders, Way To Go, Kiddo, Banner Builders & Floral Frenzy. 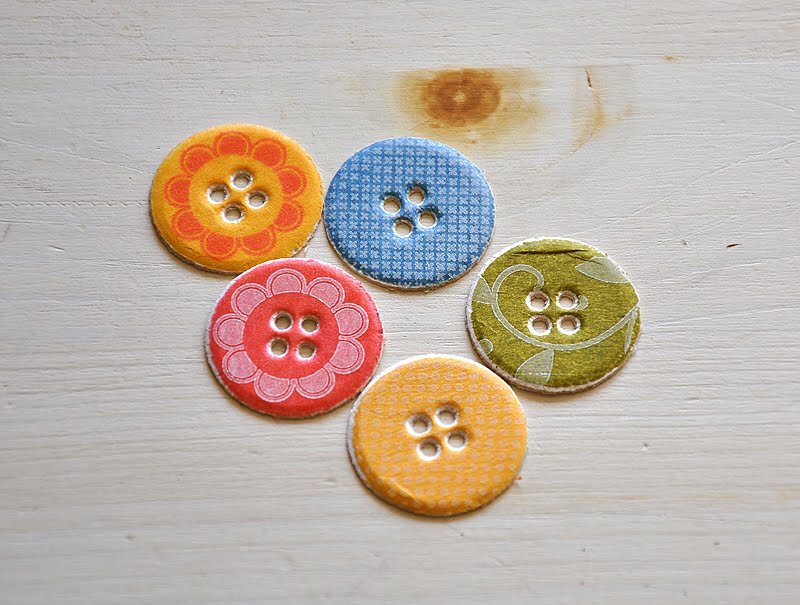 Here's a few patterned buttons using other sets. Sets used: Banner Builders, A Little Argyle, Cupcake Collection, Floral Frenzy, 2011 Birthday Tags & Asian Fuzion. I also used a couple soon to be released sets: Bitty Background Blocks & Background Basics: Newsprint. A few of them were covered using a two step stamping process. Set's used above: Beautiful Blooms II, Beyond Basic Borders, Floral Frenzy & Bitty Background Blocks. 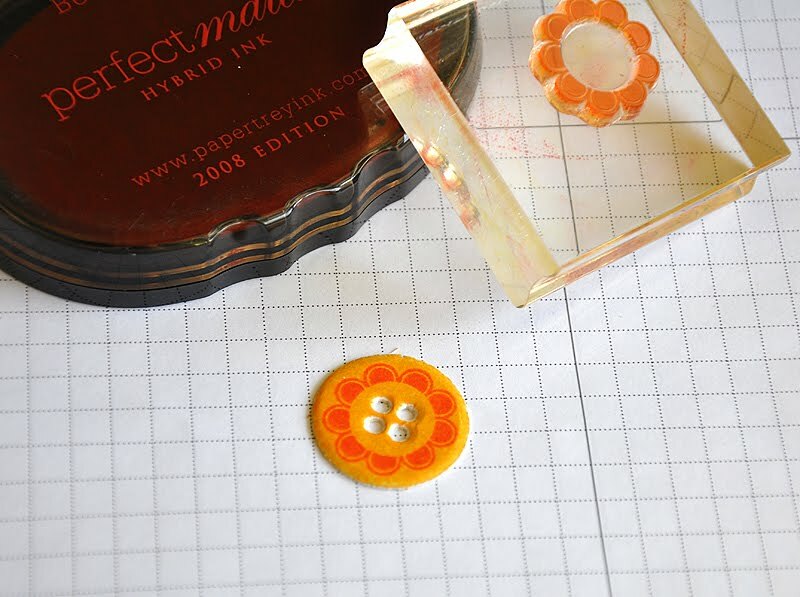 Here's How... First step: Covered the entire button using the large circle from Beautiful Blooms II. This time stamped in Summer Sunrise. 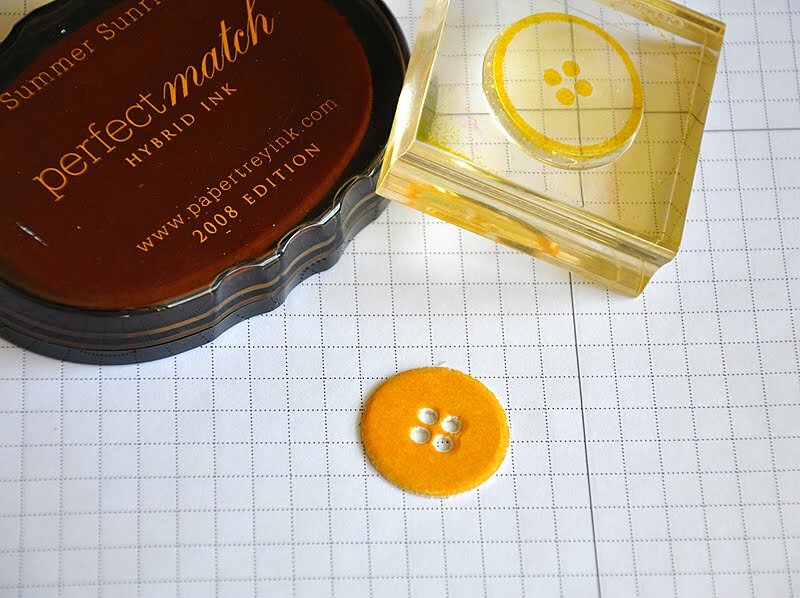 This is a great way to quickly change the color of your handmade buttons. Second Step: I stamped the pattern or flower. In this case, I used a flower from Floral Frenzy stamped in Berry Sorbet. Then finally, I put these buttons to use. I strung them up with button twine and attached, at varying heights (using multiple layers of dimensional adhesive), to a Rustic White card base. Finished it off with a sentiment. Here's How: Also included in the Button Boutique set are images perfect for building your very own and unique button cards. I started by die cutting the button card from both cardstock and Clearly Creative Cardstock. I stamped the button card images onto the cardstock. 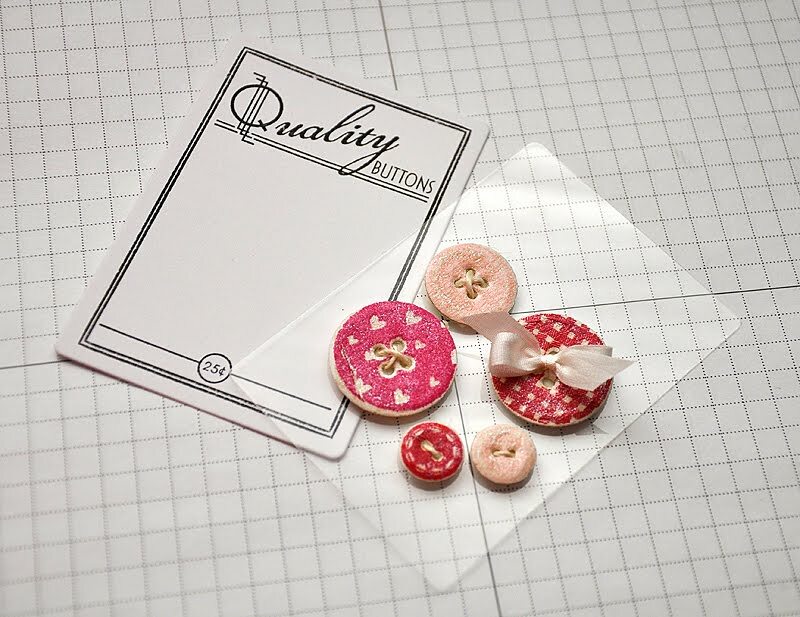 Then stamped and threaded my handmade buttons; which I arranged and attached to the Clearly Creative Cardstock with dimensional adhesive (this way they can easily be removed and used by the recipient. To attached the clear cardstock permanently to the button card: I flipped the clear cardstock/buttons over, placed Scor-Tape behind the buttons (this way the adhesive is hidden) and attached to the button card. One last fun tip! I love the look of the real life iridescent and shimmery buttons. This same look can be achieved, on your handmade buttons, by using a shimmer spray or paint. Can you see the shimmer in the photo above? Pretty, don't ya think?! Wow, I love this! you are amazing! Oh incredible buttons, Maile! Thanks for sharing all of those little tips about making patterns on them. Your card is ADORABLE! A leaning tower of buttons, eek! 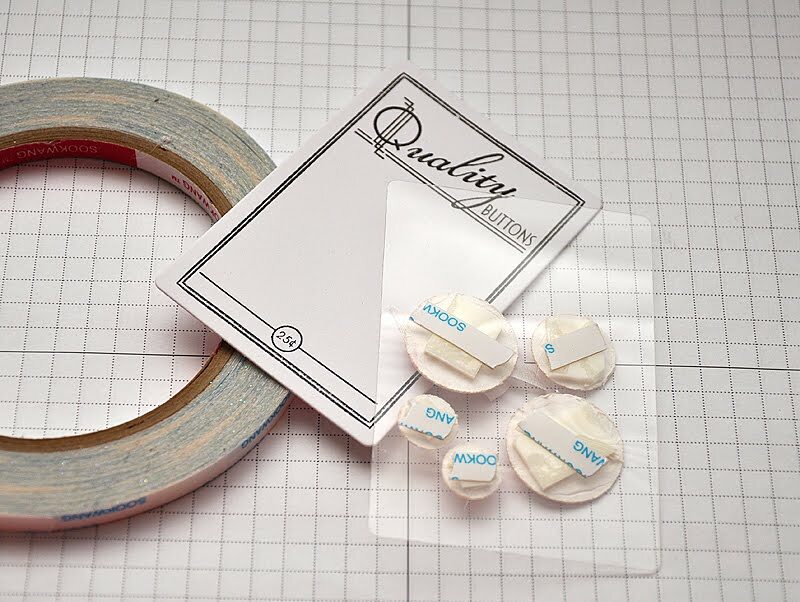 With these sets you can make tons of buttons and make them all different. Thanks for sharing your techniques while making them. I love the way you did your card! Looks like so much fun to create that big pile of buttons! Thanks for sharing all the detailed info! I love all the buttons! They're so pretty! oh i love the idea of using clear cardstock and glittering on button! So sweet! This is so sweet, Maile! 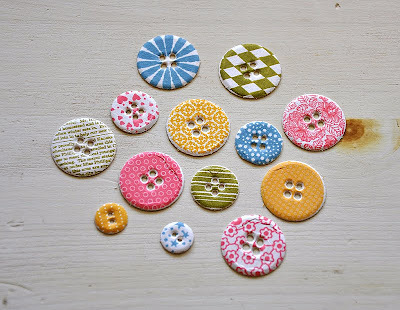 Love your pile of yummy buttons! Wow. this is really a gorgeous card. I love all those buttons. Plus they are not so heavy like the real buttons. 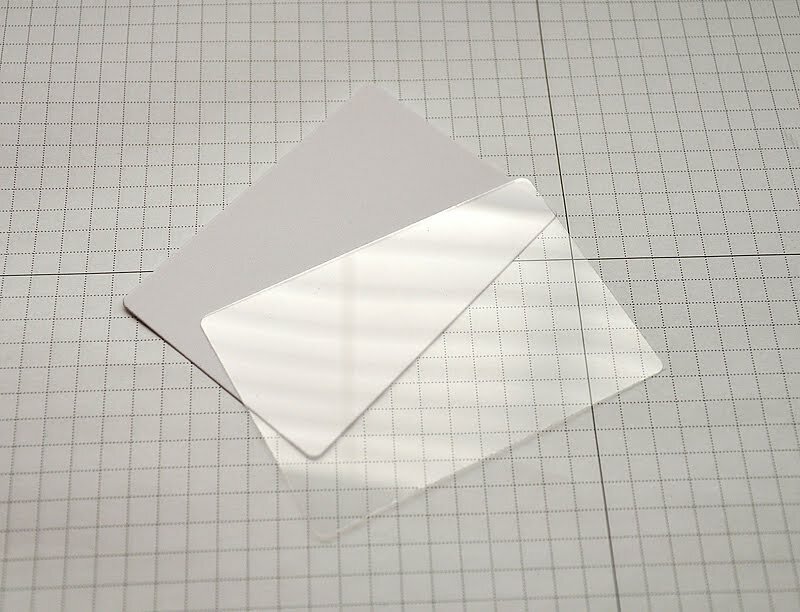 Perfect for cards, and more. The birhtday card is adorable! What a nice colors! Ok these were all fantastic I just loved them and the images stamped so well on the buttons with such color I am seriously impressed. I can't wait to own these now. This post threw me over the edge! How could I possibly resist these new goodies after seeing all this loveliness--and thinking about all the possibilities. Fabulous---as always, I might add. Oh my gosh, Maile..! Your take on this new PTI set is so wonderful!! LOVE, LOVE, LOVE!!! Thanks for sharing the step-by-step process.....I LOVED your card, so simply yet stunning at the same time!! Lovely card and great tips for making a variety of buttons! Your card is terrific! Enjoyed all your creations, the colors and patterns, your idea to use clear acrylic so your creations can be used by the recipient too!! wow! the possibilities for making buttons is endless. thanks for showing us how. your card is adorable. great inspiration. So I don't think I'll ever buy real buttons again with this new release!!!!!!!!! Maile, what awesome and wonderful buttons-I'm going to have to stay up and get these ordered up quick when they go up-yep, I said "up" three times, can you tell I'm excited?! Maile, I'm speechless! 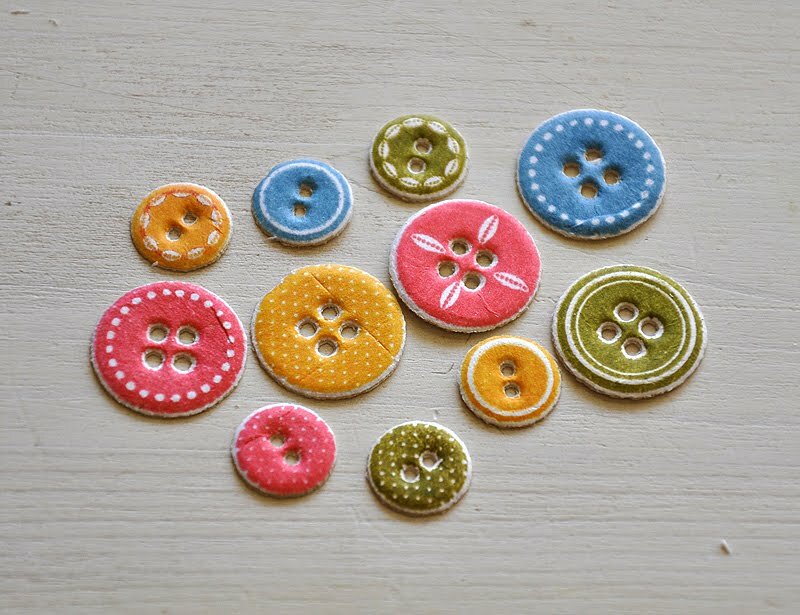 These little button gems are AMAZING, simply AMAZING!!!! SO amazing!!! Love all you create! Love your card. Can't wait to get started making buttons. Wow, look at all those gorgeous buttons! Love all of the colors and patterns you used! Love it! Those buttons are amazing!!! Wow, that's all I can say. I was loving how you used all these images from other stamp sets and how perfect they looked as buttons - especially the argyle one - swoon!!! THEN I saw your card - Wow (again)! Your style is so great and simple - love it. Can't wait to get these and try this out. Thanks so much for the inspiration. WOW!! What a great set!! 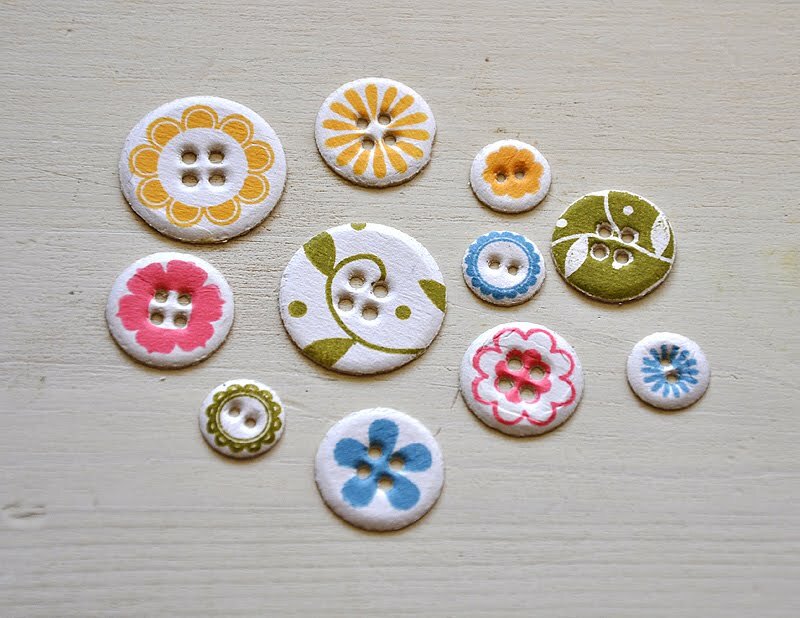 LOVE your adorable buttons!!! All I can say is wow. This is just outstanding. I MUST have these! Wow wow wow. And what is this "Bitty Background Blocks" of which you speak? I have a feeling I'm going to NEED that one. You went crazy with all that beautiful, button goodness! Can't wait to try my hand. Maile! I cannot even tell you how OBSESSED I am with these buttons. I am not even a button person - but you have me sold! Oh my word . 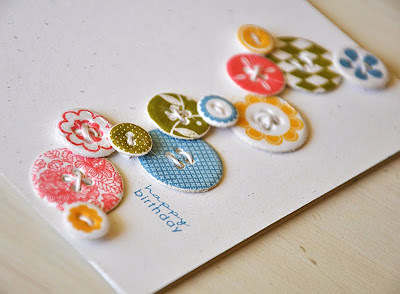 . . love all the buttons and the card is too cute! Love it all! I'm totally inspired! 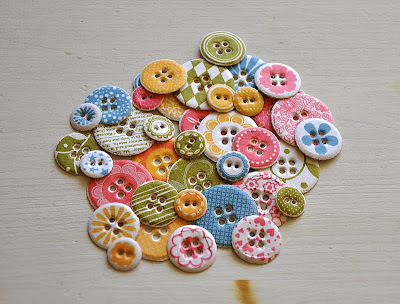 Oh, I just love your pile of buttons! Your card is absolutely gorgeous!!! LOVE these projects! Thanks for your wonderfully clear illustrations and technique advice. And thank you so much for stopping by my blog yesterday! You should have seen my reaction when I saw that Maile Belles had commented on my blog. ;-) You're a sweetheart. You are an inspiration! Can't wait to get going with these buttons. You always think of such creative projects. 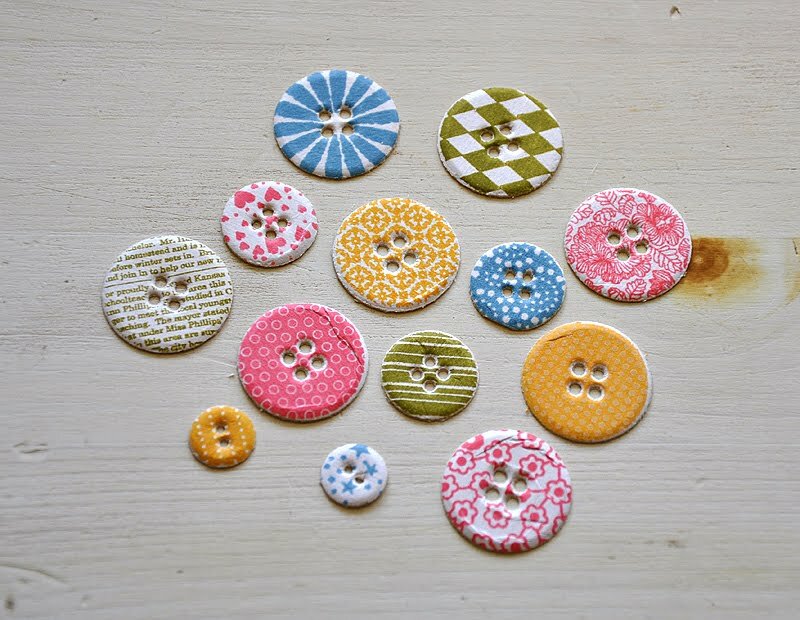 Love, love, love your buttons! Even if I could have nothing else, I must have these dies. You have totally sold me! And your card is just awesome!! Thank you for showing me how to make the buttons!! So cute. The card is adorable. Thank you! These cards and buttons are so clever and cute. You girls are doing a fantastic job! You always do such a fantastic job on whatever you do. Love the card and button card gifts. Just perfect. That is the cutest thing I have ever seen!!! I love the variety of buttons you created. The colors, the patterns - to die for!!! When I saw that pile of lovely buttons, I thought, "What a pile o' happiness!" I have a question, is it hard to get a clean impression when stamping on the buttons? They look somewhat indented in the centers. Oh, you have done such an awesome job with the assignment! Your love of buttons is expressed. I love how you used previous sets as well to make so many unique buttons! Looks like the possibilities are limitless! Thank you for such inspiration! I love your style. I sure hope you have a huge supply of the button dies, button card die and the coaster board in supply. You are going to be a busy store on the 15th. This collection is so much fun. I will be first in line to purchase. Maile your pile of buttons are so cute and colorful. I can't wait to play. Your buttons are beyond fabulous! I can't wait to order the sets and get started. And I must tell you how much I appreciate your comments on my blog. Just the idea that you dropped by is a thrill. Thank you. LOVE the buttons...and especially love the idea that you are gifting them by adhering to clear card stock so the buttons could be used again on a different card. 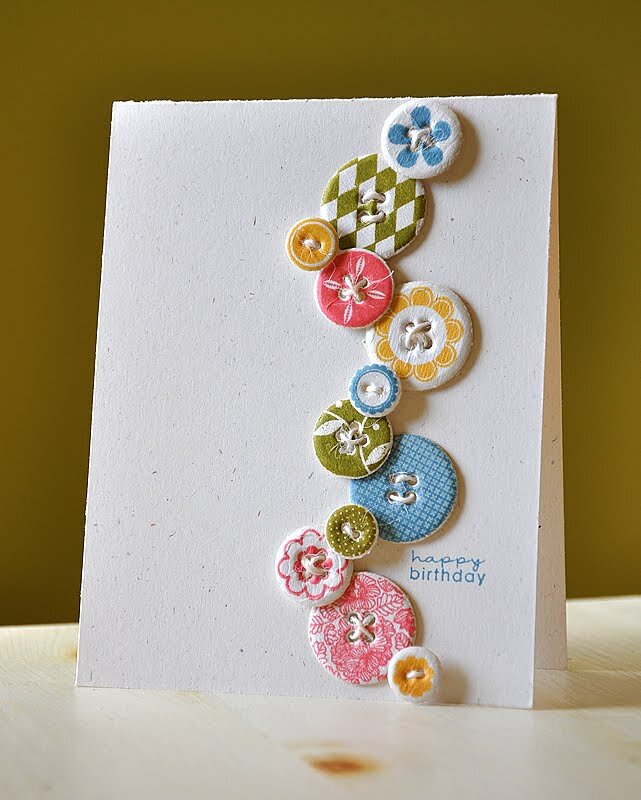 Your card is so amazing, truly focuses the eye on the varying sizes, colors, patterns of buttons! Woo hoo! 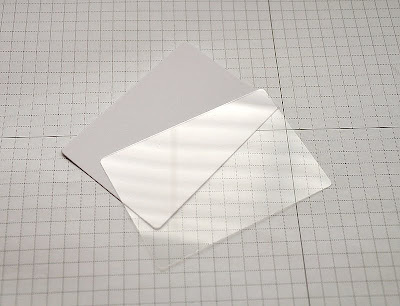 I loved your comments on PTI Radio about making CAS cards. You truly rock the style, woman! Love the card you made! That simple line of buttons is so great! REALLY---I love it!! Thanks for the great idea! Wow Maile, I immediately loved this set when I first saw it on Nichole's blog, but thought 'I'd only use it once or twice and then never again' - now I don't think that any more. I have to have those button dies now! Thanks for sharing your lovely work. Those are all so precious! 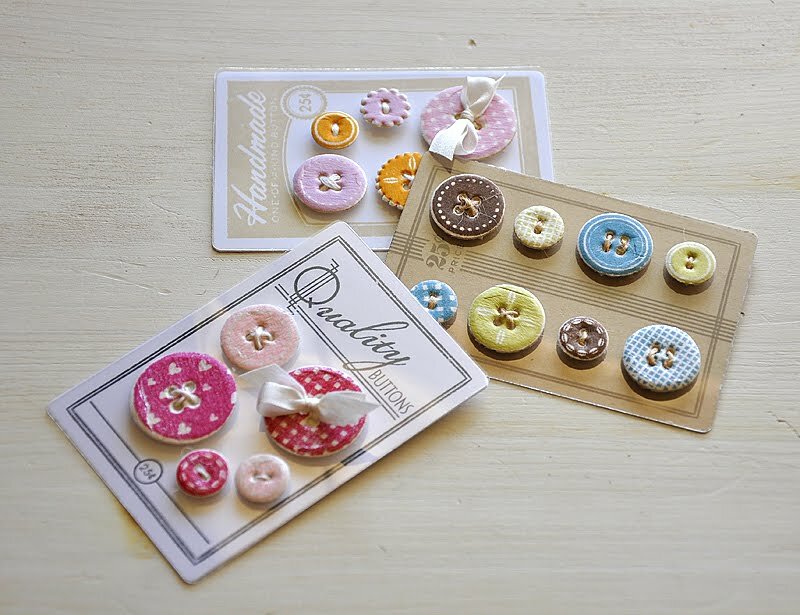 What a cute gift the little sets would be for a fellow crafter, too. Way to go, Maile! I received my button dies and Button Boutique set; but the coasters were sold out very early after the release at midnight. 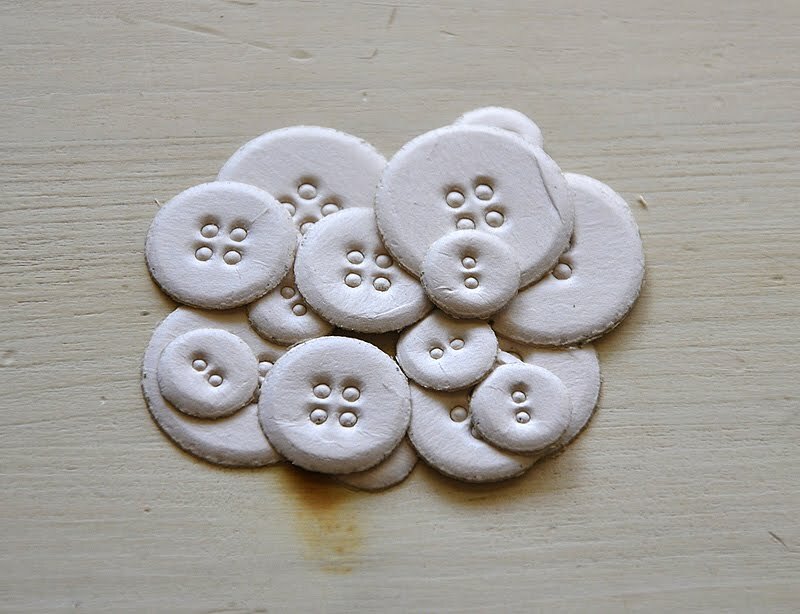 I have been looking again and again at your wonderful buttons. They are so gorgeous. The dimension and shimmer awesome! I am having a problem getting the die cuts from the die....I am hoping that one day with the coaster board, they will begin to look like yours. Thanks for the inspiration! I am truly looking forward to your new stamp set release in March! Hi Maile. 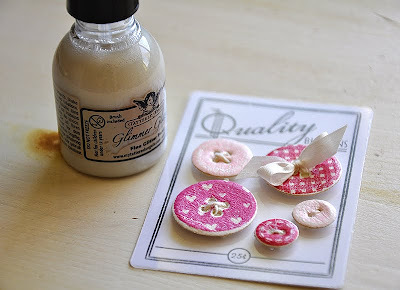 I went back to this post of yours to see how to make chipboard buttons. I'm having trouble cutting through the chipboard coaster with my Cuttlebug (too thick). I'm using chipboard coasters I bought several years ago. How thick are the PTI chipboard coasters? You said that you cut them easily. I'm wondering if my chipboard is just thicker than the PTI coasters. Thanks.